Last week when I wrote, “ Extraordinary Measures Today, a Financial Funeral Tomorrow ,” I didn't literally think that the funeral would actually occur ‘tomorrow'. Someone started the financial Armageddon clock when the ratings agencies downgraded AIG this evening and the Fed told AIG that they were on their own to raise capital. It was reported on CNBC that they have until Wednesday to secure $75 billion or risk being forced to declare bankruptcy--setting off the most nightmarish of scenarios. Is this how it ends? I have a hard time believing the US government isn't holding some kind of a trump card (possibly a figurative ‘gun to the head' of Goldman, JP Morgan, others to ‘pony up'). Otherwise, all of the Herculean, extraordinary measures they have made up until now would be a waste of time (all of those weekends they could have been watching football like the rest of us). They will almost undoubtedly pull something out before permitting the entire world to descend into credit chaos. I think they have enough juice left to avert the financial catastrophe once again. But the smell of fear is nonetheless becoming more and more palpable. Many in the goldilocks crowd appear to be entering a state of shock. It is actually healthy to move out of denial and into panic. It means you at least have chance to survive. But you have to react appropriately. Once you get your bearings and correctly position yourself, you can move from panic to equanimity. As I wrote in my last article , deflationary-type investments have been the winners since mid-July. They have certainly outperformed the Goldilocks gang this decade, but have lagged those who have been positioned for inflation, benefitting from a much weaker US dollar. Many of the inflation investors have seen their portfolios grow several-fold since 2002. But many of the gains enjoyed by those who were “long inflation” quickly evaporated over the last few months, placing many of them on par with the performance of those who were “long deflation.” Deflation means portfolio death for those who are betting on inflation. Today, a Bloomberg article titled, “ Asia to `Monitor' U.S. Banking Crisis; Assess Impact ," quotes Tony Tan, deputy chairman of Government of Singapore Investment Corp., who said, "The world may face 'Japan-like' economic stagnation as turmoil in financial markets weighs on growth and challenges the ability of policy makers to manage the crisis. If house-price declines are significantly greater than expected, larger financial institutions could become insolvent, the credit crunch would be more severe and economic growth could weaken considerably. A vicious deflationary cycle with falling house prices, failing financial institutions and weaker growth could then ensue." This captures the deflationist view of the negative feedback loop that now seems inevitable. 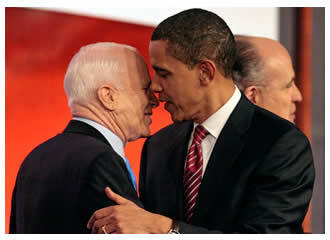 "Team Obama" and "Team McCain" may have something to say about this outcome, however. Obama is already promising free money to people who pay no income tax! Billions of dollars! These checks are going to the people who have no concept of savings and who will definitely spend it. Once he figures out that the real consumption comes from people who earn more than $250,000/year, he will be giving this cohort rebates too. McCain will do the same. Do you think they are going to sit by and watch deflation doom their economy? They may fail, but they are at least going to try. And when they do, the inflation trade will be back on. The Fed will be forced to monetize the debt in this scenario as the US Government is forced to issue more bonds to compensate an exploding budget deficit. Dollars could become worthless. Or they could fail and deflation will win out. We may remain in the grips of deflation through the remainder of the year. If problem of the financial markets bleed into the real economy as I expect, you can expect to see trillions of dollars mailed out to consumers in an effort to stave off Keynesian concerns over deflationary thrift as a new administration takes charge. McCain and Obama are both Keynesians at heart. Stimulus packages coming from Obama and Democrat Congress could be unlike anything this country has ever seen. They could call it “The Great New Deal Society.” Descendant of FDR and LBJ could show up on the White House lawn as the bills are signed into law. You should expect for the markets to oscillate between inflation and deflation until the final reckoning occurs and be prepared to reposition accordingly. Those who are positioned one-way will likely see their portfolio shredded a little more each time the sword-sharpened pendulum perilously swings from one extreme to the other. Determining which ‘flation prevails (“who wins”) might depend on which team “has the ball last.” There is one possible “buy-and-hold” strategy designed to hold up in both scenarios. I discuss it in my commentary .